Teacher and student feedback from teachers and students drives our development. This software release includes several new teacher-requested features. When students enter responses, their work will automatically save in the background as they work. There is still a Save button at the bottom of the page. We’ve removed the Save Progress from each section. As part of this update, we’ve also improved the feature that requires a section to be completed before students can move to the next section. Read more about this feature here. Students’ work is automatically saved as each response is entered. When using the Grade by Question tool, teachers can click Grade Anonymously to remove the students’ names from view while grading. The linear regression trace extends to the origin when Show origin is selected on the graphing tool. This allows students to see the vertical-axis intercept (y-intercept) on the graph, as well as in the linear regression equation. 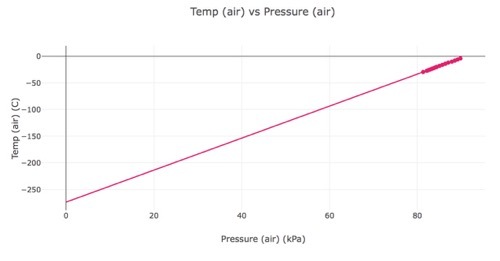 This extrapolation on a Boyle’s law graph lets students see the vertical-axis intercept -273 C! Stay current with the latest from Pivot Interactives.